Why buy from Top Notch? 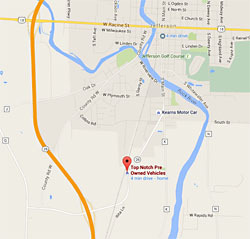 You will find us just south of the city of Jefferson, on the west side of Business 26 (Exit 25 off of Hwy. 26). At bottom of the ramp, take Business 26 towards Jefferson. We are approximately .75 miles down, the second driveway on the left. We can be open by appointment. Please call (920) 674-3000 during business hours, or call Bob at (920) 723-7304 any time. Due to their value and condition, most of our vehicles are in secure storage. We would recommend making an appointment if you wish to inspect a vehicle. We have many options available to transport your new vehicle to you in a secure, timely, and cost-effective manner. Please call us for more information. For all of your collector vehicle needs, visit JJ Best. They offer financing and many other services.